This mobility newsletter was originally published on March 23, 2018. 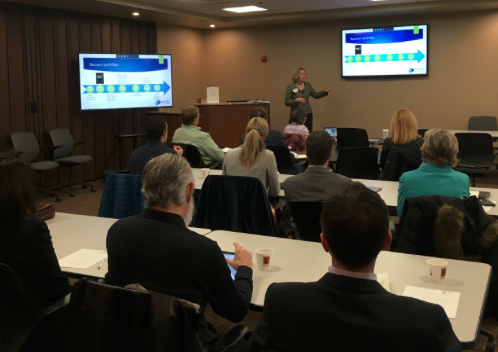 Yesterday, Michigan EIBC hosted its second Electric Vehicle (EV) Convening at the Michigan Saves office in Lansing, Michigan. This meeting centered around customer awareness and education. Michigan EIBC President Liesl Clark opened Thursday’s meeting with a discussion of the background activities that led to the EV Convenings – including technical conferences at the Michigan Public Service Commission, the Institute for Energy Innovation’s MEC4: Powering Mobility Conference and the “Powering the Mobility Revolution” report that followed, and a series of DC fast charge planning meetings hosted by the Michigan Agency for Energy. Clark’s introduction was followed by a panel discussion of automakers’ perspectives on consumer and dealer education. Britta Gross, who oversees Advanced Vehicle Commercialization Policy at General Motors, spoke broadly about the state of the electric vehicle market in the country, and GM’s strategies to grow the market. Gross explained that EVs are still primarily being driven by “early adopters” – people who are excited to try new technologies, and GM is focused on getting general consumers interested in EVs. GM’s targeted advertising focuses on story-telling and intentionally keeping the Bolt EV in the news with positive stories. GM tracks customer responses to its Bolt EV in the following ways: Mystery shopping, in which GM representatives “shop” EV certified dealers to ensure that they are providing customers with quality information; early- and mid-buyer studies, in which GM looks at how satisfied customers are with their EV purchase over time; and customer satisfaction metrics measuring brand loyalty and dealer experience. Up next, Lisa Teed, U.S. Marketing Strategy Manager with Ford Motor Company, discussed Ford’s perspective and customer education model. According to Teed, customers may face barriers when confronted with the option to buy an EV that can include price, range anxiety, and dealer motivation. What followed was a conversation on customer psychology and behavioral economics, in which Dr. Brandy Brown, a Senior Evaluation Consultant at CLEAResult, and Dr. Anne Niederberger, Vice President of Marketing and Development at Enervee, provided a third-party perspective on the importance of consumer education by utilities. Niederberger explained that Enervee is a data and behavioral science company working to make it simple and compelling for people to buy clean and efficient energy products. Enervee has historically worked in the area of energy efficient appliances and home upgrades, such as advanced lighting and HVAC, but is launching a car program in May. An Enervee survey found that most customers want clean vehicles and low fuel costs, but they don’t realize that an EV would give them those results. In fact, Niederberger referenced another study conducted by a separate group which allowed respondents to virtually “build” their dream car, which often ended up being an EV. As Niederberger explained, we need to make people realize that an EV can be the car that has the features they desire. Niederberger described a website Enervee built that provides customers with information on different vehicles and allows them to compare their non-EV “dream car” to the closest EV match so they can see the benefits of buying an EV instead. Brown discussed CLEAResult’s work with utilities and their customers on EVs. Brown explained that CLEAResult’s approach is to make EVs desirable. CLEAResult’s approach is to meet the customer where they are – often on online forums or social media pages – rather than expecting customers to come to them for information, to close the information gaps by providing them with accurate and helpful information, and to advise them during the product evaluation period. The Smart Electric Power Alliance (SEPA) released a report entitled “Utilities and Electric Vehicles: Evolving to Unlock Grid Value.” Based recent EV forecasts from Bloomberg New Energy Finance, electricity consumption will grow from a few terawatt hours a year today to around 118 terawatt hours by 2030. SEPA’s EV report finds that many utilities may be unprepared for this sudden change in load growth. 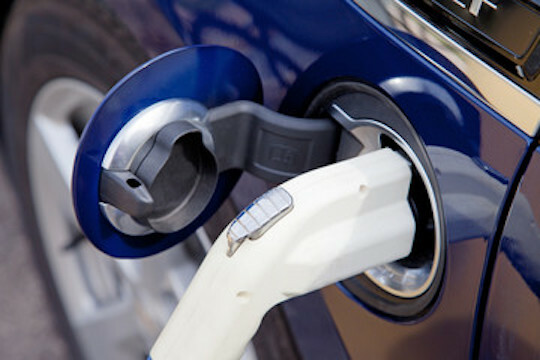 The report uses data from nearly 500 utilities, which accounts for approximately 70% of total US customer accounts, as well as analysis of over 70 EV-related state regulatory dockets to analyze utility EV programs, provide an overview of regulatory decisions regarding utility investments in EV infrastructure, and give recommendations for strategic utility planning on EVs. Individually develop a robust EV strategy that best aligns with customer interests, regulatory and policy environment, risk appetite, and ultimate goals for the technology. Help build consensus and agreement among stakeholders around the utility’s role in transportation electrification and charger deployment. Collaborate with other utilities to reduce the time and costs associated with starting up new programs. Collaborate with the broader industry. A federal judge ordered the Michigan Auto Dealers Association to turn over documents related to its role in legislation blocking Tesla and others from selling vehicles directly to customers. GM is looking to expand Bolt production and CEO Mary Barra called on Congress to consider the role of policy. In an MLive article, a driver discusses the inconvenience of driving his Tesla 3 to Chicago for repairs because the company is not allowed to have a dealership or repair shops in Michigan. Ford unveils its new vehicle platform and drivetrain roadmap. Utilities are urging Congress to raise the EV tax credit manufacturing cap, which currently maxes out at the first 200,000 EVs from each manufacturer. Electric vehicles produce significantly fewer greenhouse gas emissions than gasoline-powered cars, “regardless of the local power mix,” advocates say. A new study explores the viability of vehicle-to-grid technology. Minnesota regulators propose splitting the state’s $47 million share of the Volkswagen settlement between urban and rural areas based on where vehicles were registered. Tesla’s electric semi-truck prototype is traveling the Midwest, and attracting the fans and critics along the way. Mainstream automakers are posing a serious challenge for Tesla as they catch up on EV technology. Tesla applied for permits to build a drive-in restaurant in Santa Monica with electric-car charging stations. Volkswagen is investing $25 billion in battery supplies and technology as it looks to increase EV production. Uber filed a new patent, saying self-driving cars will use lights to “talk” in traffic. Unfortunately, the company was forced to pull its self-driving cars off the road after an autonomous vehicle fatally struck a pedestrian. A Futurism blog lists six ways automakers could employ blockchain technology. Too much sun could pose a challenge for autonomous vehicles. 3M has plans for autonomous vehicles. Michigan EIBC member Sempra Energy sees an opportunity to use surplus wind power for EVs. Grand Rapids 2030 District invites you to “Un-Paving the Way: Celebrating Commuter Friendly Workplaces” on April 11 at Founders Brewing Co. in Grand Rapids. Register here.